In the late 1880s, Fort Payne experienced a massive economic growth as investors and workers from the New England Area engulfed the region in search of coal and iron deposits that had been discovered a few years earlier. This period became known as “Boom Days”, or simply the “Boom”. Once the Boom promoters realized that the iron and coal deposits were much smaller than expected, many of them left the region, and Fort Payne experienced a period of economic decline. Fort Payne’s population at the beginning of the twentieth century was only about 1700, as compared to over 3500 in 1890 during the Boom. Most of its citizens realized that the city’s future prosperity would depend upon small industries and the surrounding agricultural area. That downturn shifted in 1907, when on October 16th at 6:30 a.m. the doors to the Florence Knitting Company opened for business. It housed 30 machines that knitted socks. The building would later become known as the W.B. Davis Hosiery Mill, when March 15, 1915, Davis decided to increase his 10% share and be the major company stockholder by trading his brother-in-law, James H. Witherspoon his stock in another mill for complete ownership of this mill and began operating with his son Robert E. Davis. This would become the beginning of a new era and decades of hosiery manufacturing in Fort Payne. In the 1990’s, the hosiery industry in Fort Payne employed over 7,000 people in more than 125 mills. It produced more than half of the socks made in the United States. Fort Payne became the largest single location of hosiery manufacturing in America and become known as the “Sock Capital of the World”. But soon after, the North American Free Trade Agreement and the Central American Free Trade Agreement lowered tariffs on textile products imported into the United States, resulting in large increases in sock imports. By 2005, hosiery mill employment in Fort Payne had declined dramatically and several mills had closed. That decline continued until only a few mills remained in Fort Payne. 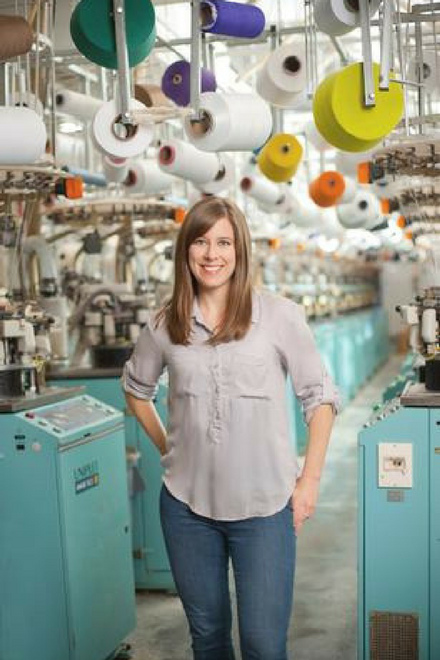 It was during that time that Gina Locklear discovered her own passions for organic and green living and wanted to find a way to incorporate that into her family’s business to help recreate the business model and revitalize some of the sock industry here in Fort Payne, all the while keeping her family business alive and thriving; a business that they had worked so hard to create from nothing. Gina says that in 2008, she had an epiphany and “realized that I could combine my desires of continuing my family’s sock making tradition, while supporting a sustainable lifestyle, and this could be done by creating an organic cotton sock. 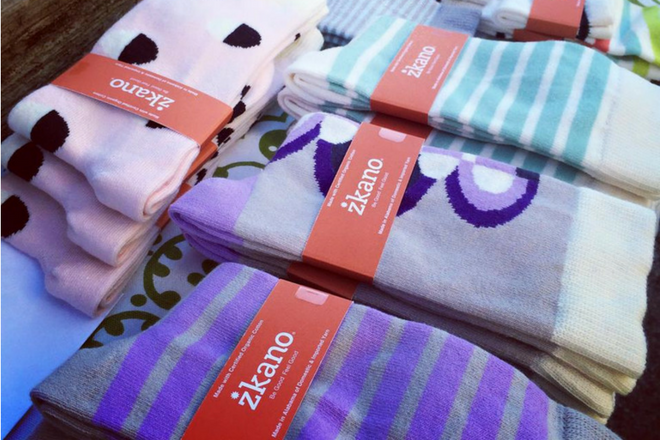 My wheels began turning, and after extensive research and product development, my little sock company, zkano, became a reality. I’d finally found a way to be a part of the family trade that is incredibly near to my heart and doing so by taking it in a new direction that reflects my passions of organic living and sustainability. Our area is very well known for our beautiful outdoor scenery and breathtaking landscapes, such as DeSoto State Park and Little River Canyon National Preserve. Little River Socks and zkano use those as inspiration for their sophisticated knit designs and say they are a nod to the beauty and depth of this area, creating each sock with pride and care, honoring the land by using the highest quality organic cotton and sustainable practices. In the fall of 2015, Martha Stewart and the editors of Martha Stewart Living presented Gina with an American Made award, which they give each year to a few artisans and small-business owners to provide a boost of recognition; and that is just what it did. After being recognized by The New York Times as the “Sock Queen of Alabama”, the title seemed to stick. More recognition came from The Wall Street Journal, Inc. Magazine, Southern Living and many others. Even Tony Hale’s character on the HBO show Veep wears zkano socks in every episode. Over the past few years since zkano and Little River Sock Mill captured this national attention, Gina’s family noticed a tremendous increase in drop-in traffic. With no true storefront to sell their socks or share their history, Gina saw the need to build a brick and mortar presence to sell their socks to visitors passing through town; it just so happened that the perfect place for the shop was in the same fully-operating mill that creates their organic socks. 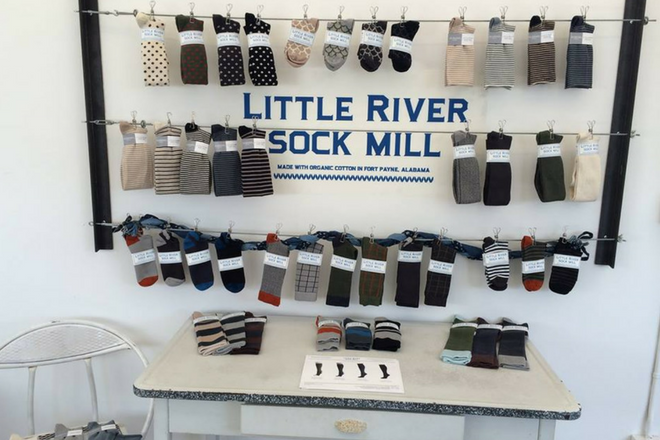 So, this holiday season, Alabama maker supporters, tourists, visitors and locals will be able to purchase zkano and Little River Sock Mill socks right here in the former “Sock Capital of the World”, with the opening of The Mill Shop. Located in the original sock mill (Emi-G Knitting, named for Gina and her sister) that’s long been run by Gina and her family and featured on NBC Nightly News, The Mill Shop will include a full storefront with versatile sock varieties for men and women, and give guests the opportunity to experience the rich mill’s history in person. Tentatively, The Mill Shop will be open December 1st, just in time for holiday shopping, with hours from 9-5, Monday through Friday. They will also be sharing details on a program fostered by the brands called zkano Recycles. This initiative takes old socks and has them recycled, which in turn allows for that yarn to be used elsewhere. Reduce. Buy only high quality, sustainable items that you truly love. You’ll wear these things more frequently and, because better quality means increased durability, you won’t have to purchase replacements as often. Dust rag. Slip a sock on your hand, dampen with cleaner and have at it. Wash and reuse. Drink cozy. Want to insulate your drink? Put a sock on it. Cold stays cold and hot stays hot. Heat packs. Fill a sock with rice, seal it and heat in the microwave for 1 minute. Draft protector. In the winter, wedge stuffed socks in front of doors to keep cold air out. Dog toy. Place a tennis ball inside a sock for an added layer of chewing fun. Recycle. Old fibers can be reworked and reused. The most worn out cotton fibers can be composted. Here’s where we come in.